Bobby Fischer, the reclusive American chess nut who became a Cold War icon when he dethroned the Soviet Union's Boris Spassky as world champion in 1972, has died. Fischer died yesterday in a hospital in Reykjavik, Iceland. No immediate word on the cause of death is known. Born in Chicago and raised in Brooklyn (he went to Erasmus High School on Flatbush Ave), Fischer was a U.S. chess champion at 14 and a grand master at 15. He beat the Soviet Union's Boris Spassky in a series of games in Iceland to claim America's first world chess championship in more than a century. But his reputation as a chess genius was soon eclipsed by his genius side effect idiosyncrasies. A few years after the Spassky match, he forfeited the title to another Pinko, Anatoly Karpov, when he refused to defend it. Fischer then dropped off the face of the earth and out of competitive chess, emerging occasionally but usually just to make erratic and anti-Semitic comments. A real charmer. Fischer, whose own mother was Jewish, accused "the Jew-controlled U.S. government'' of ruining his life. Hey, tell me about it. He remained in obscurity until resurfacing in 1992 to win an exhibition rematch against his nemesis Boris Spassky on the Yugoslav resort island of Sveti Stefan in violation of sanctions imposed to punish then-President Slobodan Milosevic. A fierce critic of his homeland, Fischer became wanted in the United States for violating the sanctions. He renounced his American citizenship and moved to Reykjavik, Iceland in 2005. Later in 2005 Fischer told reporters that he was finished with a chess world he regarded as corrupt, and sparred with U.S. journalists who asked about his oft anti-American tirades. "The United States is evil. There's this axis of evil. What about the allies of evil -- the United States, England, Japan, Australia? These are the evildoers,'' Fischer said. 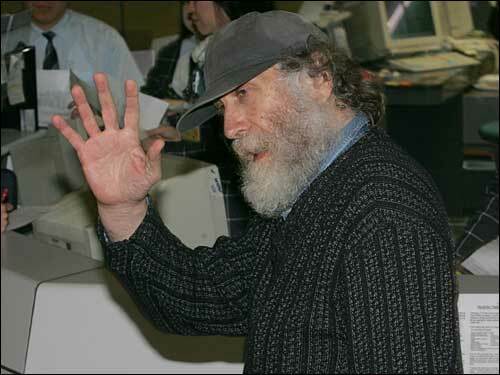 Robert James "Bobby" Fischer was 64 years old.